Thank you for joining me as we count down to the next MFT release. We are just two short days away from the big day! All the new Stamps, Die-namics, and Stencils will be available on Tuesday, March 3 at 10:00pm EST. Be sure to check out the MFT Blog to see all the new items being revealed today. Don't forget to leave a comment on the MFT Blog. Countdown posts, YOU could win one of the five $75.00 gift vouchers. 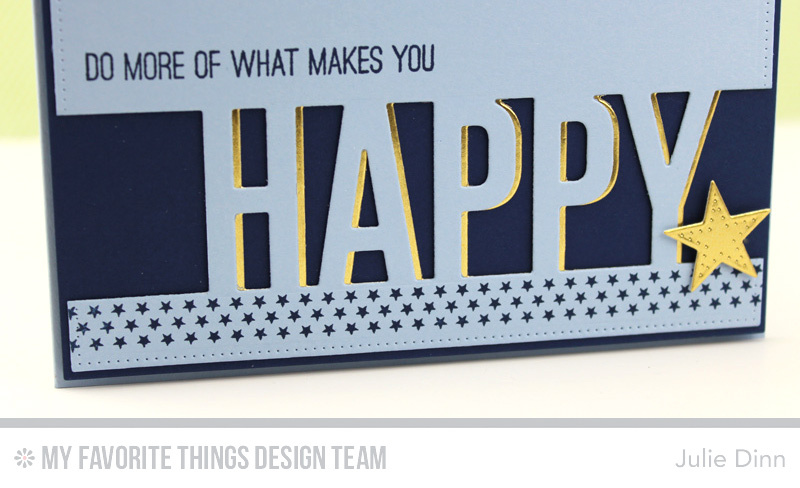 My card today features the new Happy Die-namics, Totally Happy stamp set, and two of the gorgeous new colours of card stock being released this month, After Midnight and Blue Breeze. 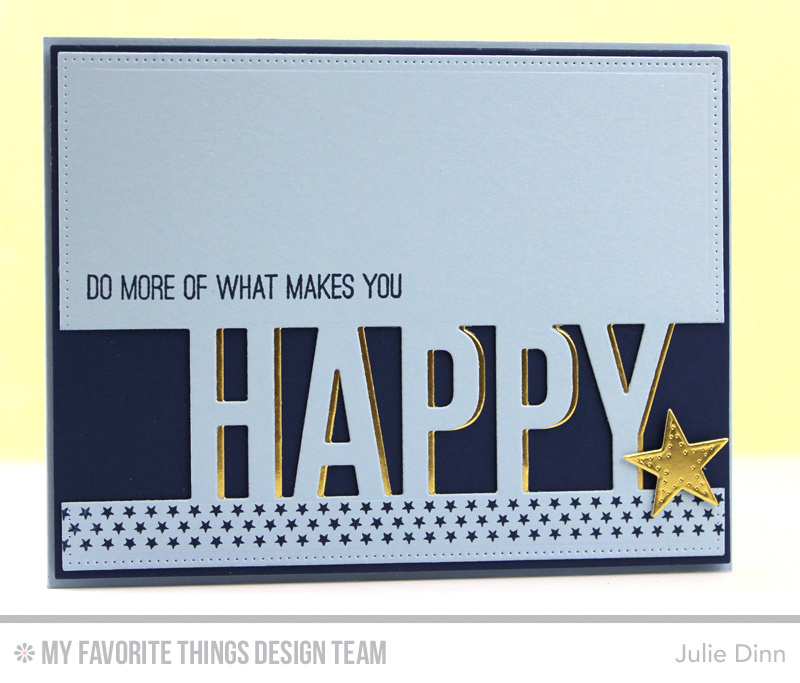 I die-cut the Blue Breeze and Gold Foil card stock with the Happy Die-namics. I offset the two pieces of card stock just slightly so the gold would shadow the Blue Breeze. I stamped a border of stars along the bottom of the card with After Midnight Premium Dye Ink. The sentiment is from the fabulous, Totally Happy stamp set. On the inside of the card, I stamped a sentiment from the Totally Happy stamp set. I also added a few more gold pierced stars. 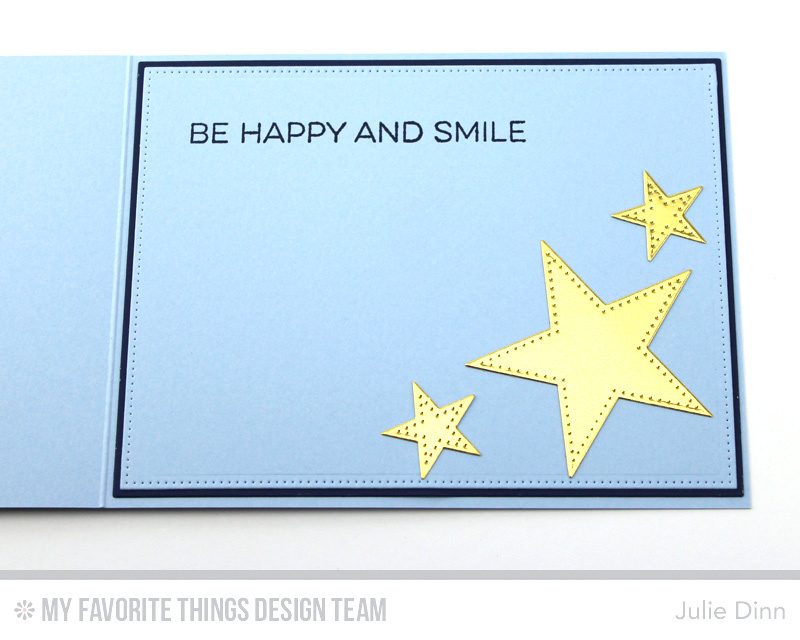 Like the look of the layered happy and then the matching gold stars. I really love the after midnight color-makes it look like you need to get out the "ball gown" and tuxedo. Love the gold foil shadow look on the letters for this die. Brilliant and Beautiful Card. Amazing card - love the CAS look and the gold offset. Serene and hopeful all at once. The gold shadow is very effective. Super designs and colors. Love how you offset the HAPPY. Love the off set,great card! Wow! Fancy Smancy with that Happy die cutting, and I love, love, love it. So many thanks for showing it to me.